Toompea Castle is the most famous and the most majestic construction in the whole city. It is built 50 meters above sea level and is located on a steep limestone hill in the centre of Tallinn. This castle is considered the oldest and the largest architectural complex of Estonia. At first the castle was meant to be a fortress, but later it became the symbol of authority. As legend has it, Toompea is the grave mound of an ancient Estonian hero, Kalev. It was built out of boulders by Linda, Kalev’s widowed wife, who cried so much because of her husband’s death, that her tears formed the nearby Lake Ülemiste. It is believed that the first wooden Toompea Castle has been built around 10th or 11th century by the local people of the ancient Estonian county. Later, in 1219, the castle was attacked and conquered by a Danish force under the orders of Valdemar II. The first stone castle was built in 1227 by the German Knights of the Sword and later it was sold to the Teutonic Order. The order erected some towers that are still visible nowadays. The most famous of them is Tall Hermann (Pikk Hermann in Estonian.) The tower is 48 meters tall and is the Estonian national icon. The Estonian flag is raised at the top of the tower every day at sunrise and lowered as sunset comes. When Estonia finally acquired its independence, the new parliament buildings were built in the early 1920’s. 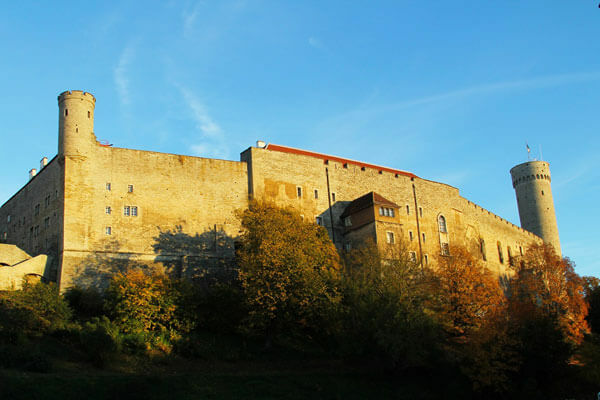 Toompea Castle has been a central administrative and military centre for hundreds of years. Today Toompea Castle successfully combines all of the phases of its’ construction, with medieval fortifications and Czarist architecture and the early 20th century parliament building (Estonian: Riigikogu).